Puns have been described as the lowest form of humor. From where we sit, we don’t buy. They can show wit, timing and a sense of play. Plus, some of them are just plain funny. Oh, sure, you’re going to find those terrible puns that make everyone groan. But, that’s part of the fun, too! 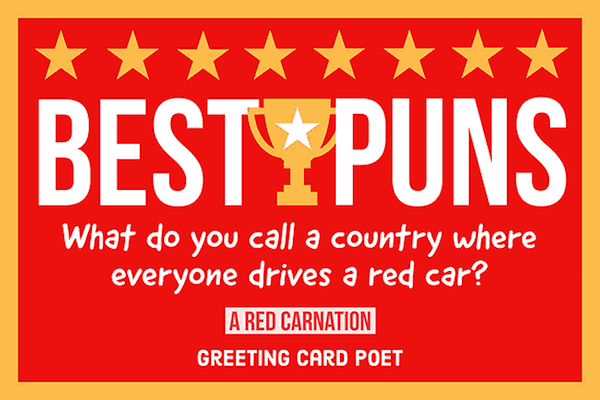 To pun is to use words that sound alike but have a different meanings. They are used for a humorous effect and these will have you thinking, laughing, and knee-slapping – sometimes, all at the same time. Sometimes in life, it’s good to just try and have little fun with some silly wordplay. So, have a look through and see if these selections tickle your funny bone. It just might be punamania! What goes “Ha, ha, ha, plop”? What’s a chimney sweep’s most common ailment? 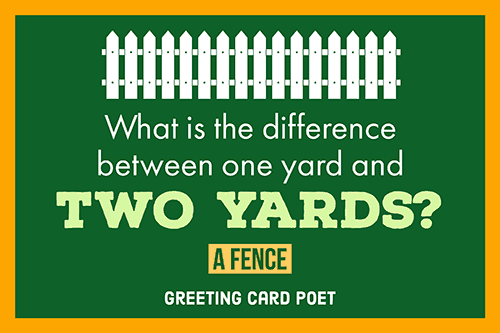 What is the difference between one yard and two yards? What color is a belch? You’ve got me in a state, and I fear that it’s contiguous. Our local hardware store was giving away dead batteries free of charge. If Satan lost his hair, their would be hell toupee. Pencils should have erasers at both ends, but what would be the point? No more nouns and adjectives, I’m pronouns. Ask your pizza guy for a joke and he’ll deliver. I’d tell you my construction joke but I’m still working on it. The best way to communicate with a walleye is to drop them a line. Taller people sleep longer in bed. Good dental customers are familiar with the drill. I’m not sure how I feel about my mood ring being stolen. If you don’t like it, the Exodus is over there. I miss your fowl jokes but I’ll get rooster it. Why was a rubber band pistol was confiscated from algebra class? Why was the dog cited for littering. Because she was giving birth to puppies near the road. 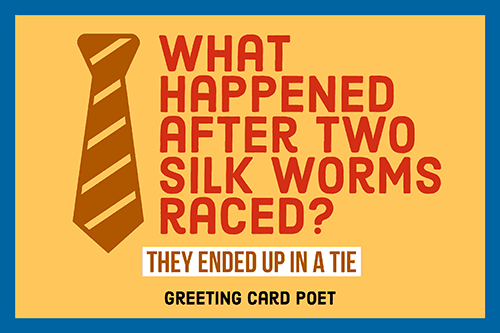 What happened after two silk worms raced? Who was the midget fortune-teller who escaped from prison? What happened to the soldier who survived mustard gas and pepper spray? He is now a seasoned veteran. Why should you work for a cause? Because you should never work for an applause. Why can’t a bicycle stand on its own. Why was the girl no longer addicted to soap? What did the tired couch say after a long day? I’m now inclined to lay back. 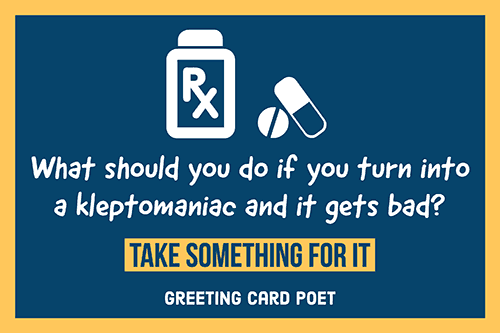 What should you do if you turn into a kleptomania and it gets bad? What happened to the thief who stole a calendar? What happened to the batteries who let out of jail? They were given out free of charge. Why did the relationship end between the dentist and a manicurist? Because they constantly fought tooth and nail. What is a dead giveaway? No, that’s just how I roll. What kind of food is hard to beat in a race? What happens when you see one shopping center? I asked my mother to make me a pair of jeans. She was happy to, or sew it seams. I’m pals with 25 letters of the alphabet. What’s the difference between our pizza puns and a pizza? My pizza puns can’t be topped. I was waiting in queue for a fruit drink, but I forgot the punch line. What happened to the guy who fell onto an upholstery machine? Why was the photographer sad? Because he had a photographic memory which was never developed. What happened when the woman discovered she had grey hair? What happened to the woman who fell into the glass making machine? She made a spectacle of herself. Puns are the kind of witticisms that many enjoy. Although they can be quite clever, but often come off as silly, cheeseball attempts at humor. It works by using a comedic phrase which plays off of the sounds and double meanings of words. The fun play on words is what really gets people thinking — after you stop belly laughing that is! Why are rivers always rich? What day of the year is a command to go forward? What do you get when you pour cement on a burglar? What happens when you dream in color? It’s a pigment of your imagination. What do you get if you cross a bullet and a tree without leaves? A cartridge in a bare tree. Why was the man comfortable with seeing the dentist? Because he already knows the drill. Where did the king put his armies? Why didn’t the class want to take a field trip to the Coca-Cola factory? Because they didn’t want a pop quiz. What is the difference between a well dressed man and a dog? The man wears a suit, the dog just pants. Why do ambassadors never get sick? How often do bakers trade bread recipes? Why is the farmer outstanding? Because he’s an expert in his field. Why does the girl hate Haunted French pancakes? Because they give her the crepes. Why don’t old cashiers ever die? Because they just check out. Why was the chewing gum manufacturer arrested? What did the toy store sign say? Don’t feed the animals because they are already stuffed. Why did the baker stop baking? He didn’t make enough dough. What is a chicken crossing the road? What’s the motto of the ghoul’s convention? How do you achieve a successful diet? Put your mind over platter. Why isn’t rust is edible? Because it’s a form of car-rot. What happens to deposed kings? What is the gambler’s heaven? Punning is a virtue that most effectually promotes the end of good fellowship, which is laughing. It’s hard to explain puns to kleptomaniacs – they always take them literally. Of puns it has been said that those who most dislike them are those who are last able to utter them. The pun is the lowest form of wit. 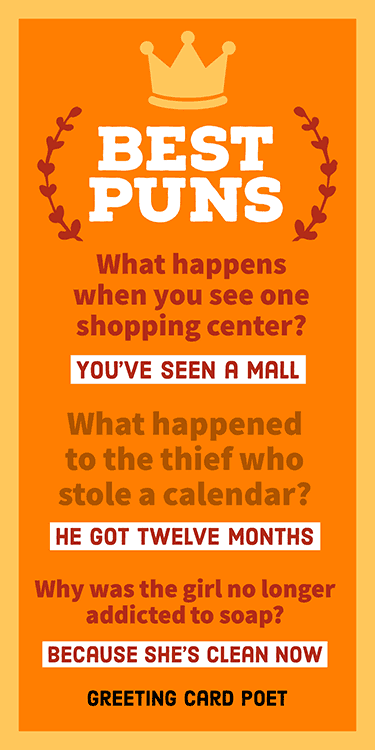 You’re on our Best Puns page.